Every so often, when I'm talking to my friends about being sad, they act surprised and say, "when are you ever sad? You're always happy." Today I have spent the day alone, doing yardwork and laundry, and I am kinda sad. I now realize that no one ever sees me being unhappy because being alone makes me unhappy, and being with friends makes me happy. 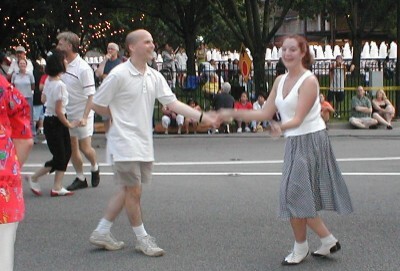 Tonight I should be extra happy because it is the annual street dance in downtown Lexington (Swingin on Main). I will get to see a whole bunch of my friends tonight, and we will all be dancing. The above photo is from the same dance last year. It is the third consecutive photoblog pic of me dancing.